Los Angeles firefighters on Saturday were battling a wildfire that has destroyed two homes and prompted evacuations, but the same erratic winds seen when the fire first broke out returned and posed a challenge, officials said. The so-called La Tuna Fire burning in Los Angeles and near Burbank, a city of more than 103,000 in the San Fernando Valley, had scorched an estimated 5,000 acres — fire officials said it is likely larger — and was 10 percent contained by Saturday afternoon. "This is by acreage perhaps the largest fire we've ever experienced in the city of Los Angeles," Los Angeles Mayor Eric Garcetti said Saturday morning. There have been no deaths or firefighter injuries, officials said. The fire broke out Friday afternoon north of the 210 freeway, and erratic winds helped it spread, officials said. By late that night mandatory evacuations had been ordered for parts of Burbank and the flames could be seen on hillsides from around the metropolitan area. Helicopters and fixed wind aircraft made water drops to battle the blaze. Firefighters on Saturday found the same erratic winds that can quickly change direction that were experienced Friday, the Los Angeles fire chief said. "We're very conscious of that, we're watching it, we're putting people in place to protect structures where needed," Los Angeles Fire Chief Ralph Terrazas said. Three structures, including two homes, have been destroyed in the Tujunga area of Los Angeles, Terrazas said. The structures destroyed had no brush clearance and they "were isolated into the foothills, very difficult for us to protect," he said. 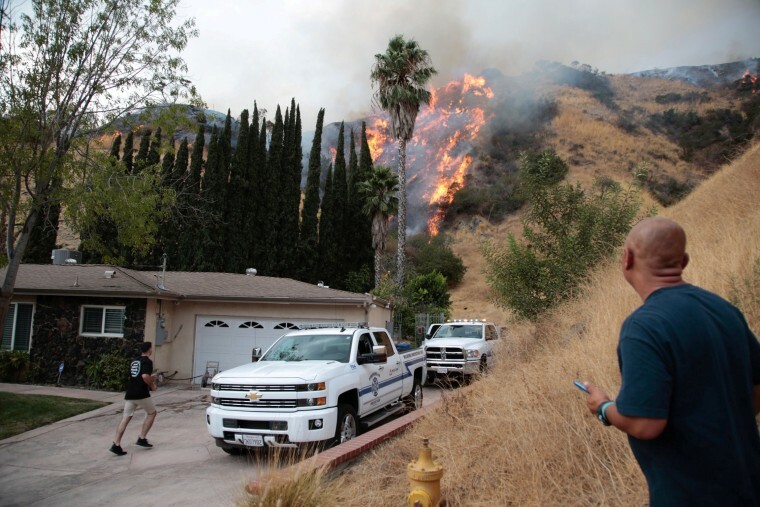 Tracy Goldman’s Burbank neighborhood was within sight of the flames and smoke Saturday, but was not under an evacuation order. "Just with the high temperatures these last couple of days, it's been on my mind," she said. "I'm constantly checking and then really could not believe the scope of what I was seeing." Silvia Gezalyan and her 9-year-old son were evacuated ahead of the blaze. "Sad. But I know my lord is going to stop the fire, I believe it," she said. "I'm a pastor and we're praying and that's why we’re here, so the fire will stop." Garcetti declared a local emergency Saturday evening, and requested the governor declare an emergency so the city can receive state and federal assistance. Earlier, the mayor sought to reassure residents that the fire was not as bad as the percent of containment may suggest. It had been 45 years since a fire occurred in the area, allowing for "plenty of fuel to burn,” he said. "People hear 10 percent and they think it's 90 percent out of control — it is not. We have firefighters that are confining this as it goes," Garcetti said. Officials ordered mandatory and voluntary evacuations for 300 homes in Burbank, 180 in Los Angeles and 250 in Glendale — with several other communities bracing for the same, Garcetti said. Much of California was under an extreme heat warning through the weekend with temperatures hitting almost triple digits in some places, according to the National Weather Service.